Take a look at the nutritional benefits of a winter vegetable and how it can be used to create a simple and tasty dinner dish. For those who are trying to make their home meals more nutritious and tasty at the same time, they need to find ways of incorporating meat and vegetable ingredients in their home cooked meals. While children and even adults would rather have meat and comfort carbs as their dinner meals, you know better than to provide them something that will only manifest as health and heart problems later on in life. It is best to use seasonal vegetables in your meals at different times of the year. You are ensured varied nutrition through the diverse ingredients as well as fresh and novel ingredients in your dinner meals from time to time. 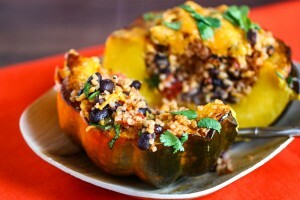 There are several health benefits to be obtained from acorn squash. It helps to boost the immune system by protecting the system from certain cancerous growths, skin and vision are improved as well as blood pressure reduced, fluid balance maintained, blood sugar as well as cholesterol regulated and bones strengthened by this versatile vegetable. The acorn squash is also termed as the winter squash as it is more available during this season when they mature though they belong to the same family as summer squashes. The flowers and leaves of the plant are also edible. 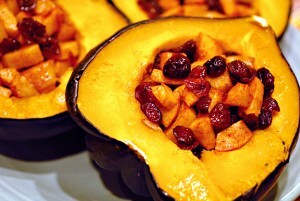 Here is a delicious and simple recipe to use acorn squash as a dinner recipe. You can start with two acorn squash, a chopped medium sized onion, olive oil, two stalks of celery, fresh rosemary and cloves of garlic as well as half a pound of sausage, one chopped apple, bread crumbs and Parmesan cheese. The squash needs to be cut off from the bottom and the top and de-seeded. After a squash is sliced in half individual, bowls can be created. Every squash bowl, then needs to be drizzled with olive oil and seasoned with salt and pepper. These bowls can then be roasted for about forty minutes in a preheated oven. The stuffing can be prepared by heating olive oil in a frying pan to which the onion. Pepper, rosemary, celery and garlic are added. Then the sausages need to be added after which the apple slices can be added and the mixture needs to be cooked till the apple slices soften up. The mixture should be mixed with cheese and breadcrumbs and added to the squash dishes. Each of the dishes need to be added the stuffing and placed in an oven for roasting for about twenty minutes. Children as well as adults are bound to love this dish which can be served with a salad and a fruit on the side to make a wholesome dinner. The dish by itself will combine the goodness of a vegetable, fruit and pack in the protein requirements as well. For those who are on a diet, they can add on slim cheese topping on the staffing to reduce the calorie intake of the dish. There are more nutritious dishes to try out from the link – The Turnip Root can be Eaten in Many Ways.